Not only had the Greek people chosen radical left party Syriza as their leaders on recent elections, but they also think that the austerity measures imposed by the so-called troika must be erased. Therefore, Sunday saw a big rally consisting of around 20,000 protesters gathered around parliament building in Athens, in order to show their support towards the newly elected government ahead of Monday’s planned bailout talks in Brussels. 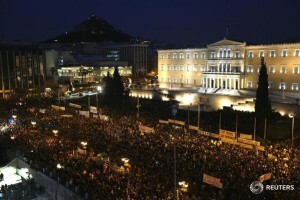 The protesters were waving banners demanding the austerity measures, imposed on 2010 as a condition of the massive bailout package, to be ended. Alexis Tsipras, new Prime Minister, promised to renegotiate the country’s debt and pull it out of its long-brewing financial crisis, hence he is seen as somewhat of a saviour of Greece. If the deal is not reached by the end of the month, when the current deal expires, Greece could be forced out of Eurozone. Unfortunately, it seems like differences could be too big to handle – while Tsipras wants some sort of a bridge program until the new deal is developed in the next few months, the rest of Eurozone demands that Greece must oblige to the commitments made under the previous deal. Otherwise, Greece would get a free pass for the bailout package agreed upon in 2010, and, what’s worse, other Eurozone countries whose position is similar to Greece, like Portugal, Ireland or Spain, could follow the example and negotiate a bailout deal whose commitments they would never fulfill. Nevertheless, it is important to notice that Supporters in other European capitals also came out in solidarity with Greece – around 2,000 people in Paris, and hundreds in London and Lisbon.